Built in 1925, the Figueroa Hotel in Los Angeles preserves its original Spanish-Moroccan style. Deep amber hues and sultry reds suggest how Casablanca might appear in color. The entry table and platform bed exhibit gorgeous metal detailing. A hanging tapestry mimics the ornate architecture transporting you overseas. Top the look off with a warm lanterns and a gilded mirror. 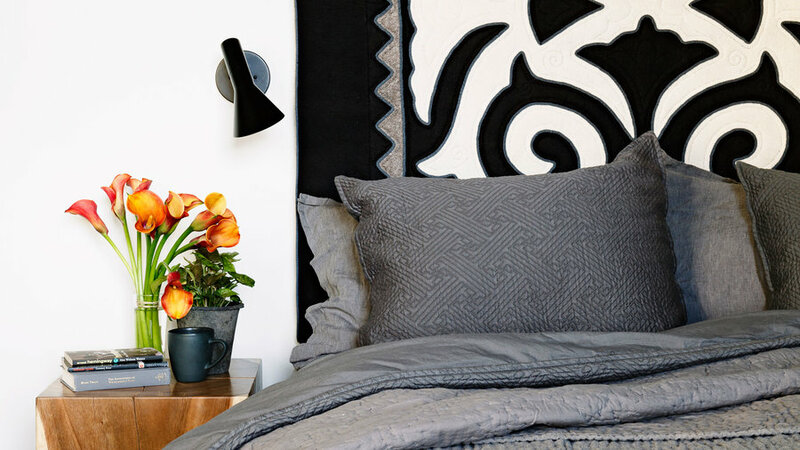 One of our favorite lofts mixes modern style with Moroccan accents. The wall-mounted credenza features Old World ebony hardware. Antique books and tiered candlesticks also contribute to the global style. Two caramel poufs provide traditional seating near the floor. Will Wick () designed this bedroom completely white. Three Moroccan elements save the room from being too neutral. The hanging lantern provides the right amount of warmth. At the foot of the bed sits a small curved stool. Hang out in the suspended lounge, draped in sheepskin. 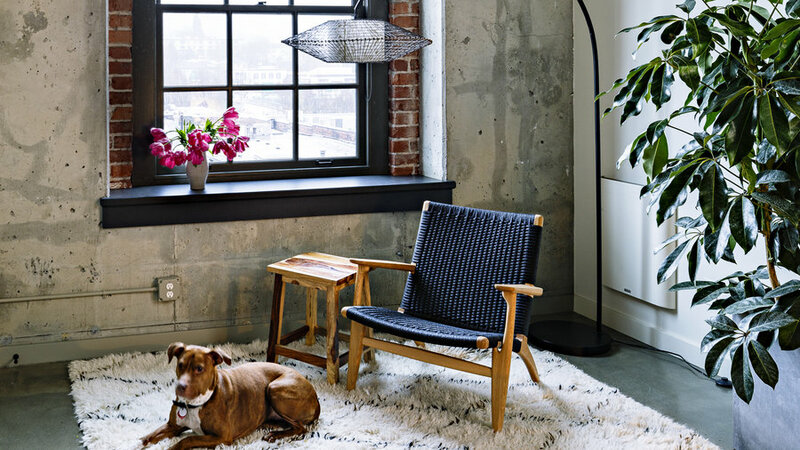 Shaggy, white rugs with black geometric designs warm up the modern-industrial loft. They’re great because they can work anywhere with other textures and colors layered on top. 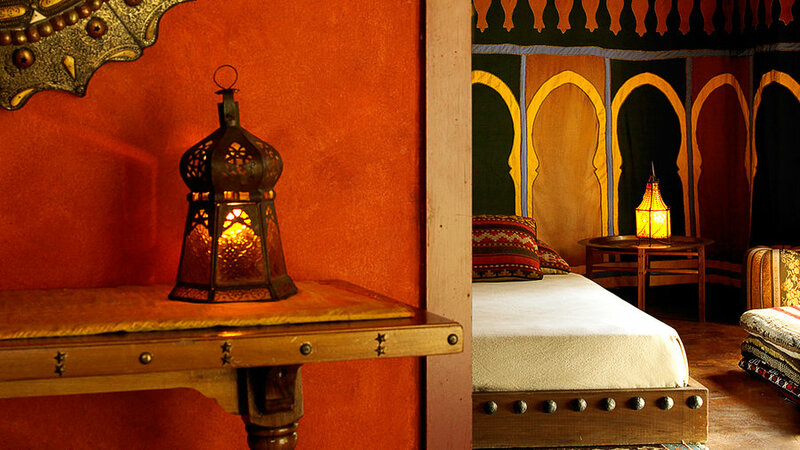 We dub this bedroom Moroccan modern. The indigo chair and bright textile on the bed incorporate the cultural vibe we love. More subtle, the faceted lamp shade translates the traditional lantern into a contemporary design. While this living room mixes many styles and prints, it incorporates five elements of Moroccan design. The first is luxurious foliage with emerald hues. Over the fireplace, the mirrors exhibit geometric shapes. 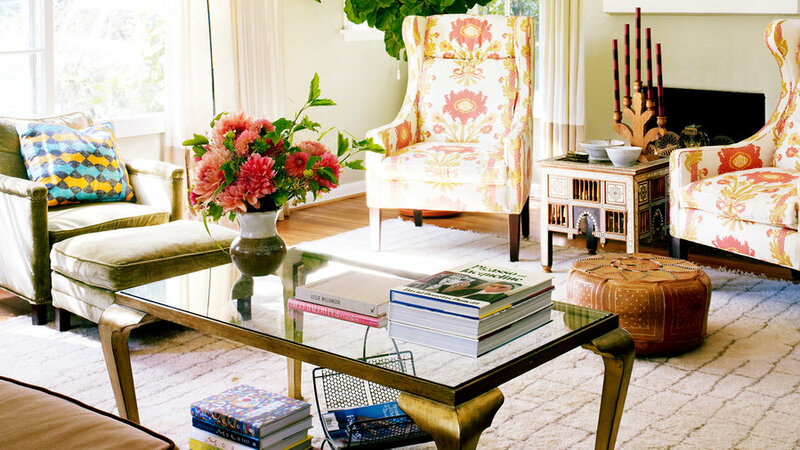 Gilded elegance dresses the coffee table. You’ll find low seating in the pouf. Lastly, the table between the wingbacks features traditional ornate design. Textiles speak global style. For a subdued look, choose black and cream like this tapestry that serves as a headboard. The almost floral pattern adds a rich element to the bedroom. Beside the bed, a natural wood table contributes to the bohemian look. Layering an ornate textile on your covers adds an instant global vibe. 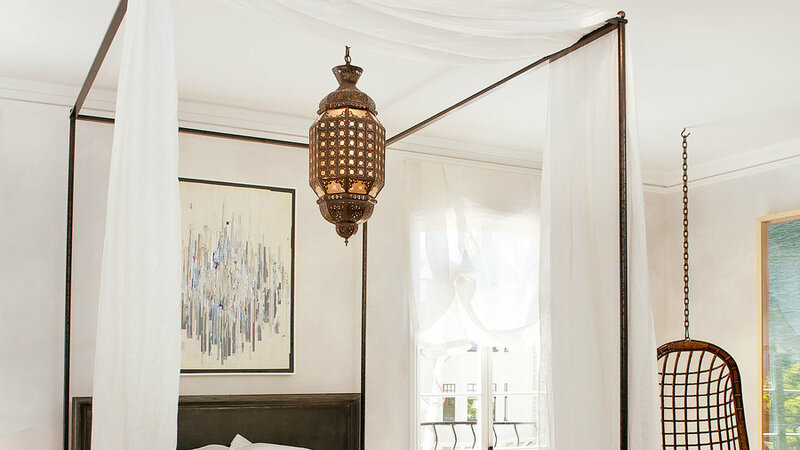 This four-poster already felt bohemian with its textured headboard and blackest brown wood. 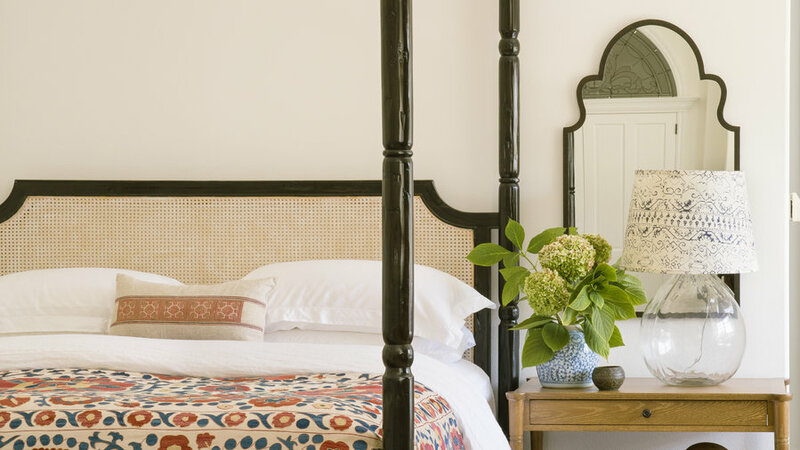 On both bedsides, Moroccan-shaped mirrors reflect international style. Create your own backyard oasis with cultural elements. An overgrown wisteria vine creates a lush atmosphere. Bring the indoors out with a deep red rug. Above the table, a candlelit Moroccan lantern illuminates the space for a glorious nighttime hangout. 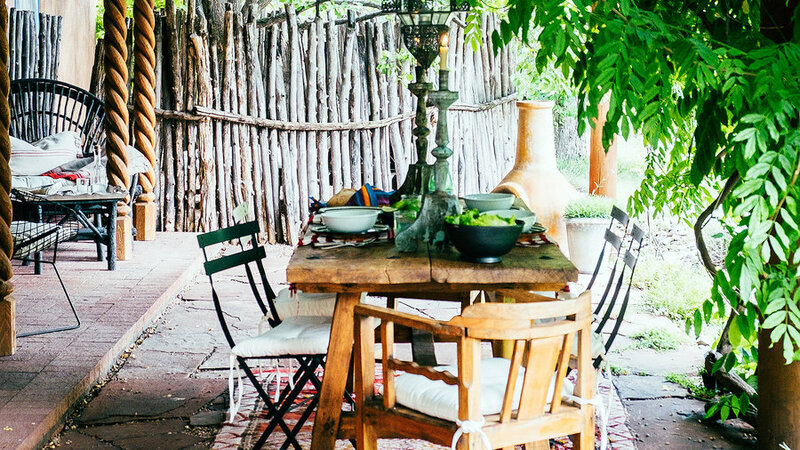 What’s more Moroccan than an outdoor lounge? 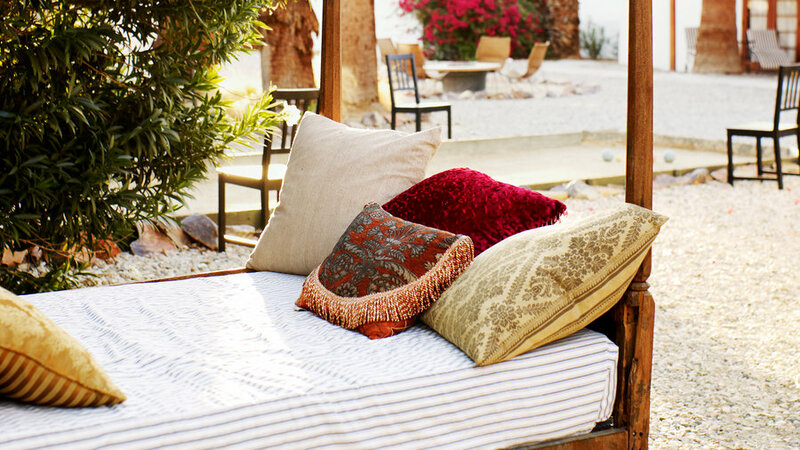 This Old World daybed provides the perfect place for an afternoon siesta. Toss pillows with golden and red fabric onto the plush seating. You’ll find this luxurious courtyard at the Korakia Pensione in Palm Springs. Moroccan accessories add an interesting element when mixed with other styles. 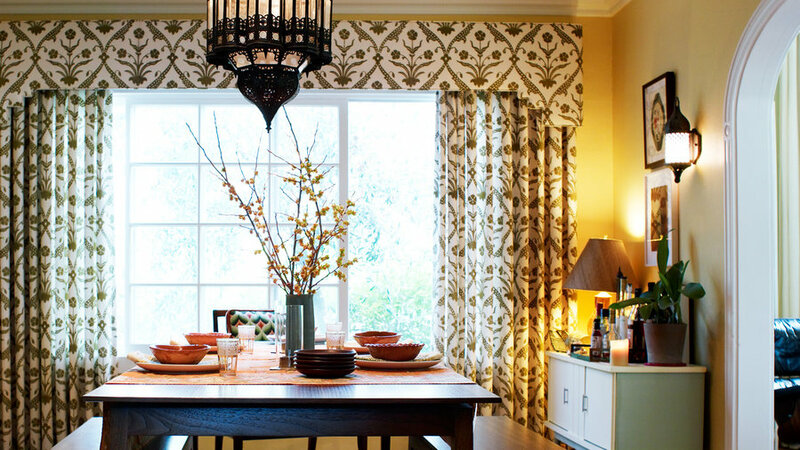 Layer an ornate lantern over a streamlined mid-century table. The faceted chambers of this pendant steal the show.